My Kennewick is the official mobile app for the City of Kennewick and it's free! The app makes it more convenient for the City to connect with our residents, businesses, and visitors and for them to stay connected with us. My Kennewick provides convenient access to on-line services, city news & alerts, business opportunities, recreational activities, job openings and much more. · News – Receive official news about the local area. · Emergency Alert – Receive notification about important community news, street closures, road conditions and critical emergencies. Also get up-to-the-minute emergency updates. · Online Services – Pay your water bill, register for Parks and Recreation programs, search public records, and submit Code Enforcement issues. · How Do I – Find information on commonly requested services. · Report A Concern – Report a concern regarding water, sewer, storm drain, streets, parks or traffic. · Maps – View parcel information, zoning, and utility locations. · Business – Learn about business and development opportunities in the City of Kennewick. · Agenda Center – View agendas and meeting information for City Council and other City Boards & Commissions. · Permitting – Apply, search and schedule inspections for building, development services and planning permits. · Jobs – View a listing of all city jobs currently open for recruitment. · Report Graffiti – Report graffiti in your area. · Parks – Search parks and amenities. · Facility Rentals – Search available facilities and reserve online. · Website – connect directly to the City’s main website. 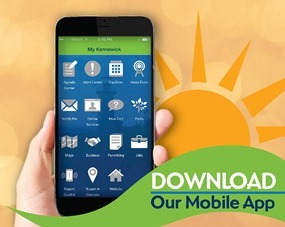 Download the My Kennewick app and connect with the City of Kennewick today!